There was, at least for me personally, an exclamation point to U of L’s disappointing performance against Virginia, a display by the home team which was even more dispiriting than the fact of the 47-63 loss. I had a parking ticket nestled between the wiper blade and windshield of my car after the game. You’d think those meter watchers would have had something better to do on such a lovely day, that they might have been a bit more understanding to disheartened Cardinal fans. Louisville was never in this game. It was an L from the opening tip. UVa, confident after scoring 18 points in the final 1:19 of its W over Wake Forest earlier in the week, was in charge from the start. Anthony Gill hit an open jumper 21 seconds in, and the Cavaliers not only never relinquished the lead, they were never threatened. Trey Lewis missed a three, the Cards rebounded, but Damion Lee coughed it up. Gill slammed one home at the other end. 0-4, Virginia. A Quentin Snider triple, then lay up, pulled U of L within two, 5-7, at at 15:59. Isaiah Wilkins answered immediately for the visitors. The rout was on. Louisville didn’t score again for 7:34, when Deng Adel netted a three. The Cardinals’ drought continued for another four minutes before their next marker. The Cards scored 14 points in the opening half, were down 15 at the break, having committed 13 turnovers. They were 4/19 from the field, while UVa had netted 13 FGs in 23 attempts against Louisville’s confused, porous defense. Louisville never threatened, before the break or after. Given my more than half century history with the Cards, and my obsession with U of L hoops, I am of course reminded of another such game from yesteryear. In January ’83, the McCray Brothers/ Milt Wagner/ Lancaster Gordon/ Charles Jones edition of the Cardinals — the team that beat UK in the Dream Game, before falling to Phi Slama Jama in the national semis — ventured to Cameron Indoor. Where, with dispatch by 15, they schooled Duke, whose talented but young and inexperienced squad included Tommy Amaker and Danny Ferry and Jay Bilas, the same contingent, which, a couple seasons later, were #1 in the land before losing again to U of L in the national title game. Anyway, that’s what happened yesterday. U of L, inexperienced, led by a couple of done&ones not used to upper echelon competition, were schooled by a gang who knows how to play their game. Virginia is not only well coached, but they are mature and very experienced. The Wahoos start two fifth year seniors, a junior, a third year sophomore and a second year freshman. They play like they’ve been here before. Which they have. They play like a team that has learned from its lessons. Which they have. The Cavaliers weren’t rattled a bit by the fervent crowd, which, following orders, was dressed in white as the powers that be ordered them to do. While U of L, attempting to play Rick Pitino’s complicated hybrid defense, was ever rattled. My point: If this talented group of Cardinal underclassmen stay together for their careers, learn from games like yesterday’s decimation, they will morph from those being schooled into those dictating the lesson plan. Real freshman Deng Adel was indeed the silver lining for U of L, as The Rick acknowledged. I would also offer Ray Spalding, a fellow rookie. A minute after entering the game in the first half, Adel confidently drained a three. He played with passion, and previously unseen confidence after a season of nervous performances, surrounding an injury. He finished with a dozen points on 5/9 shooting, while grabbing 5 boards. Spalding also tallied twelve on 5/10 shooting, while snaring 7 rebounds. The Trinity grad displayed just how special he can be on an offensive possession when Louisville was down — Ouch! — 18-41. Donovan Mitchell missed a jumper, but Spalding was there on the left side for a tip in. But, too strong, it missed long. Yet Spalding was there for a follow of his own miss . . . from the other side of the rim. That pair of rookies was 10/19 from the field. The rest of the Cards were 6/30. Louisville turned it over twice more (18) than it put the rock through the hoop (16). The major reality check is this. Done&ones are NOT the answer in the long run. Louisville needed the likes of Damion Lee and Trey Lewis this year, and won the Lottery. They were a necessity for this team to be relevant, and have done the best they can. But, there’s a reason they were mid-majors. Understand, their presence is the equivalent of hitting a scratch off at Thornton’s, not jackpotting a ten figure Powerball. Lee was most disappointing. He was ofer the opening half. 0/2 from the field, both from long range. Only 1 rebound. Two turnovers. He didn’t hit a field goal until 9:52 was left to pull Louisville within — ahem — 21 at 26-47. His six points were — in the classic sense of the term — garbage. He turned it over a couple more times after intermission, and, instead of hunkering down when his shot wasn’t falling (when he could get one off), he essentially spit out the bit. Pitino wasn’t just prevaricating after the game, when he mentioned that he saw such a bad performance coming. The immediate good news: Short turnaround. The immediate bad news: North Carolina, the nation’s best team, arrives for Big Monday. U of L has a lot of raw talent, with significant upside, and a good attitude. If this gang stays together and stays the course, success shall come. The long term bad news: It’s a long and winding road, full of more craters to be circumvented than the increasingly pot holed streets of our town. Yesterday’s game was the most inept, discouraging home-court performance I’ve seen in forty-five years of following Louisville basketball. UVA (smart and relentlessly disruptive, the 2016 national champs??) picked the Cards apart. The most troubling thing: the Cards were schooled in every aspect of the game. Pitino looked sick on the bench in his white suit. The combined play of Onuaku, Mahmoud, JJ and Matz made me feel sick. College b-ball isn’t exactly global warming. These kinds of games happen, even to good teams, and there’s still time, but I’m skeptical. The only good news from yesterday: the Cards don’t face Bellarmine again this year. A couple weeks ago, after the win vs Pitt, I asked the question whether we had our first win against a good team or whether we had just exposed another imposter. My question now is: Have we been exposed as an imposter? The next two weeks will tell. I’m not sure U of L is an impostor, whatever happens from here on out. I do think there have been a lot of false positives, and the fan base has ratcheted up its expectations, perhaps beyond what can reasonably be expected. That game was turrable……. My biggest concern as we move forward, is this……. with the exception of Adel, Spaulding and Mitchell everyone else, at one time or another, looked ready to “spit the bit”…. Lee, Nanu and Jackson being the major offenders…… and Lewis played so poorly you were hoping he he WOULD spit it. Just one game, but they need to put their big boy pants on, and play, win lose or draw, with fury precision and intensity on Mon PM……failing at that this could be the start of long free fall to mediocrity. Jackson??? If you mean Johnson, Marko, I give him a pass. I think his elbow was still hurting. Nanu also. Apparently he was pretty sick. Lee? No. But, as I’ve said, what you see is what you get with the done&ones, mid major players we’re hoping make the next step up before the end of the season. You hit it Seed. Done and ones are a crapshoot and is NOT SUSTAINABLE. Hope no one gets their hopes up on this kid from Penn, who it looks like they ran off. It was men vs. boys. Other than Lee and Lewis who royally stunk, it looked like 22-23 year old men vs. 18-19 year old boys. Kinda reminded me of some (most?) of the games I saw in P.Rico this summer. As for done and ones…having older guys like Lee and Lewis can help a young team move forward (See UVA as an example of what having experienced players following the game- plan can do for a team.). Not one of the Cav’s appeared to be even close to an NBA talent, although Gill (who looked like he may be approaching 40) may make a team for a few years if he is a glue guy with a good attitude, assuming he is not yet eligible for Soc.Security..
Ray and Deng were by far our best players Saturday. Let’s hope they keep it up and the rest of the team returns to form. Being the optimist that I am, I am going to toss this spoiled tater in the disposal and hope that it was a mere freak game that can happen to any team. We will see more tonight. If I am wrong, we may just be a middlin’ team that has done well to beat the lesser talented teams we play and cannot compete with the elite. For now, I am hoping it was a case of JJ being hurt; Nanu being sick (Lee played like he was sick too—was he?) and coach P being out-coached by Coach TonyB who seems to get as much game out of his team as heart pounding he gets from the females in attendance, All I heard after the game was “Did you see how good looking Virginia’s coach was…?” Followed by an evening at dinner of the women looking up pictures of him on the internet and passing their phones around the table. As if I needed to see that after the afternnon’s debacle……. Hey, the National Anthem was sweet! The kid from Penn got in some trouble, maybe drugs. Had to sit out. Then, when they got a new coach, he kind of asked the kid not to play this year. Or, so it is said. JGJ, nice to hear you’ve come back to the real world. Would differ in one regard. Virginia’s older players have been playing at a high level of competition, well coached, for their entire career. 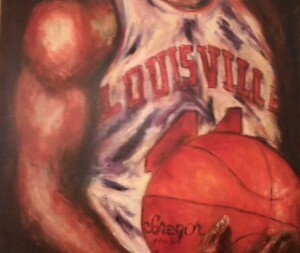 While U of L’s duo of done&ones have been playing at a level they could, game in and game out, dominate. Where they could dribble dribble dribble until they found an opening for a shot. Where they could pose after making a trey without having to worry about getting back on D. I’d opine there’s a major difference between UVa’s experience, and that of Lee and Lewis. I meant to mention Justin Ruffin’s smokin’ saxophonic National Anthem, but simply forgot. I rarely get to attend Card games at the Yum! I get to go tonight, plan to be in my seat four rows back from mid-court an hour early to bask in the energy-sucking glow of the Yum! lights, to watch the beautiful people, and to enjoy a cold beer or two and my damn good fortune in being alive on planet Earth for an ACC game. I love watching this particular Louisville team. I remain hopeful they can get it together by March, though I think we are in big, big trouble tonight against a much better UNC team.